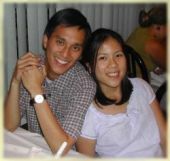 As many of you know, we are getting married June 10, 2004. We have put up this website for your convenience, in order to keep you updated with the progress of our wedding planning. It is sure a lot of work! We will continue to post updates about our wedding planning here. We look forward to seeing you on June 10th! Work on this website began two days ago. It is almost done now, there are mostly aesthetic changes that need to be done. I anticipate that we will be able to start sharing the link to this website to our family and friends soon!